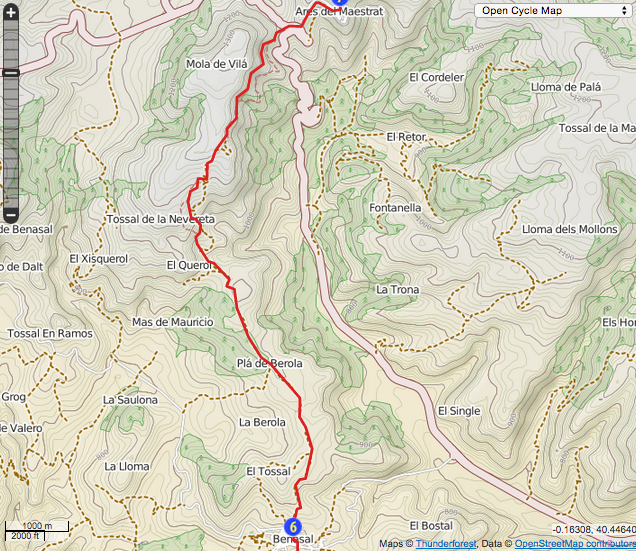 It is possible to walk all the way to Morella in a day, but it is a very big day (I’ve done it twice). 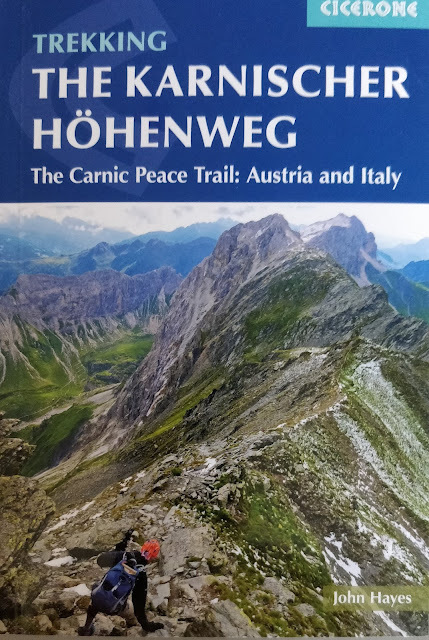 The total walk is 34km and takes around 10 hours. If you like a challenge, it’s an epic way to finish the walk through Castellón but it does mean rushing through Ares del Maestre. 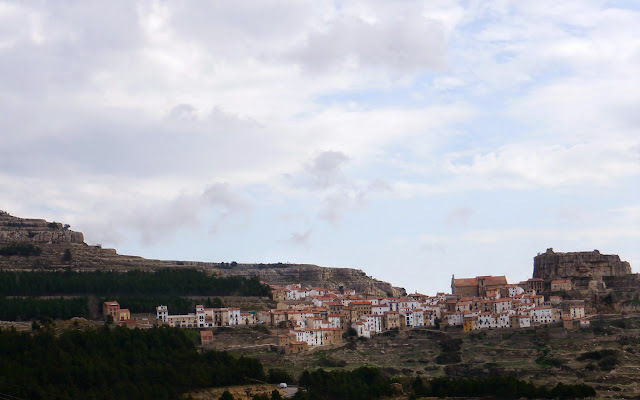 Ares del Maestre is lovely and, if you have any appreciation of hilltop towns, is a place to enjoy. It also features a nice hotel. 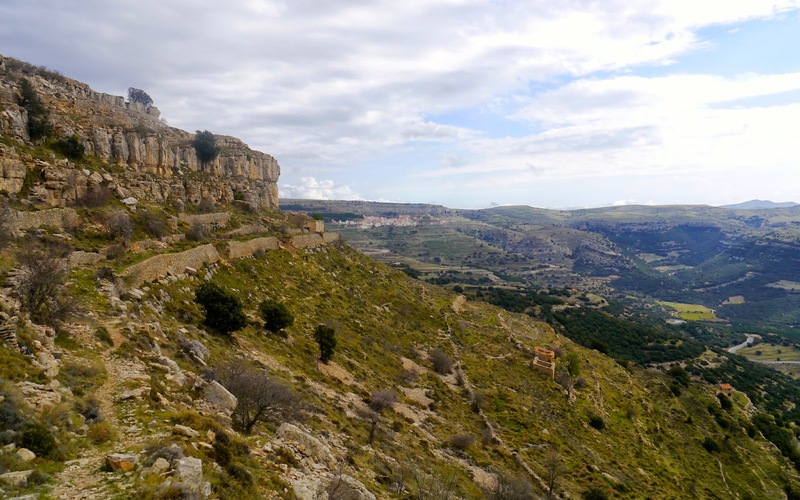 Sensible people will make a leisurely start, have a late breakfast, have a look around Benasal, then set off to Ares del Maestre which is just 11km and between 3 and 4 hours away. Although I haven’t stayed in it, the menu in the little town’s hotel looks very nice and of course you don’t have to start it until about three o’clock. If you need more exercise, there are some excellent circular walks from Ares del Maestre with the attached just one example. 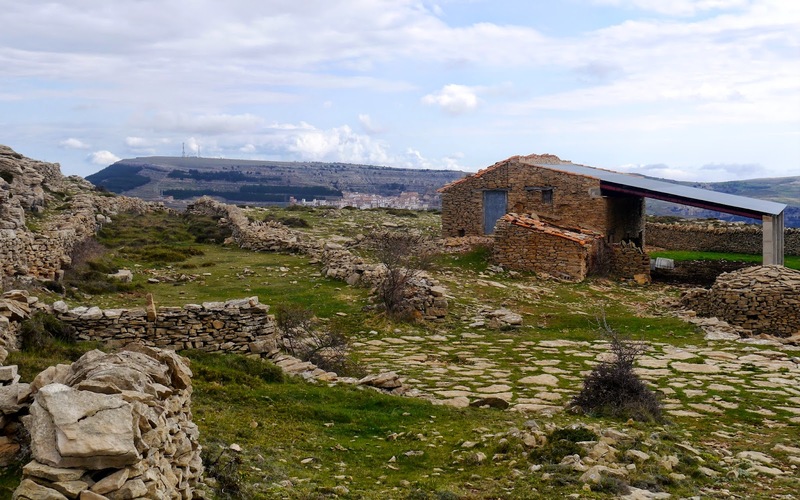 If you stayed at La Piqueta head back along the main road towards the centre of the town and after about 200m join a small street, the Calle Ares, and head north. The route follows an old drove road and turns into a concrete road and then a dirt track. Take time to look back and admire the views of Benasal and the glazed tiles of the roof of the church dome. 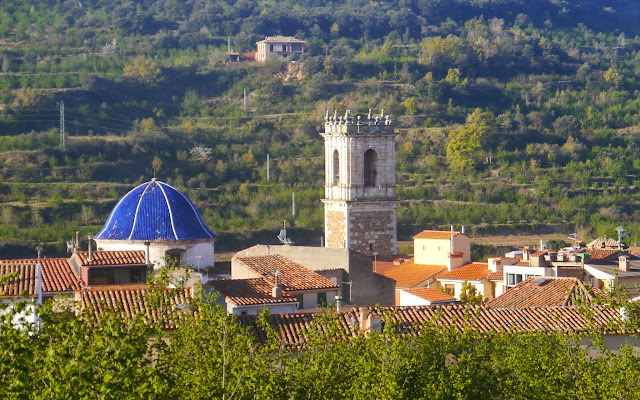 To the right, on a small hill, is the tower of the Ermita de Magdalina. Ares del Maestre, immediately to the north, can be seen early on in the walk and it looks like the twin sister of Culla, visited yesterday, which once you get above Benasal, can be seen to the south. It is however further away than it looks and is in fact on the other side of a deep gorge. The route stays high and traverses what is an upland plateau to the west of the gorge. The vegetation on the plateau is classic Mediterranean with the dry, thin soil supporting on rosemary, box and thyme. After a gentle descent the route climbs a little and swings east and follows a beautiful contoured path high up along the edge of the gorge. 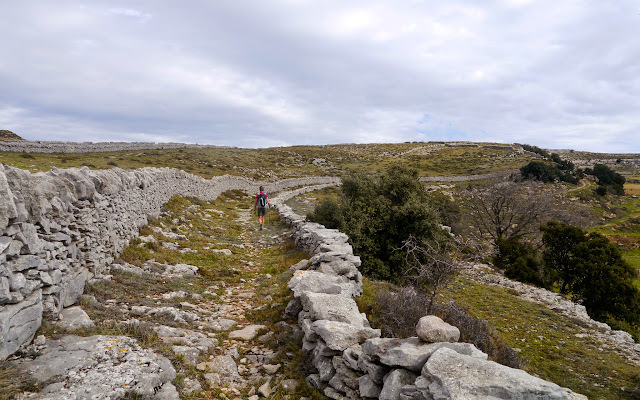 After apparently heading away from Ares del Maestre the route is at last heading directly towards the town whose wonderful location can now be fully appreciated. The hillside on the edge of the gorge is much more fertile than the plateau so expect to share the walk with grazing sheep and cattle. Just before the final approach to Ares del Maestre is the Coll d’Ares. There is a hotel and cafe at the Coll and it’s an obvious place for the vehicles that have struggled to make the climb up the switchback road to stop and have a rest. The little town of Ares del Maestre is built in the shadow of large, distinct rock promontory on top of which sits the tiny remains of a castle. It’s similar to Culla but actually much more dramatic. It’s eminently defensible position was recognised by the Romans and the Moors from whom it was captured in 12th Century and parts of the old walls, including the main gate, remain intact. It’s a lovely town with a particularly nice town square with an imposing but not so old Baroque church. The Hotel d’Ares is located in the main square. I have read your post. very excellent. your images is very nice. Thank's for sharing.